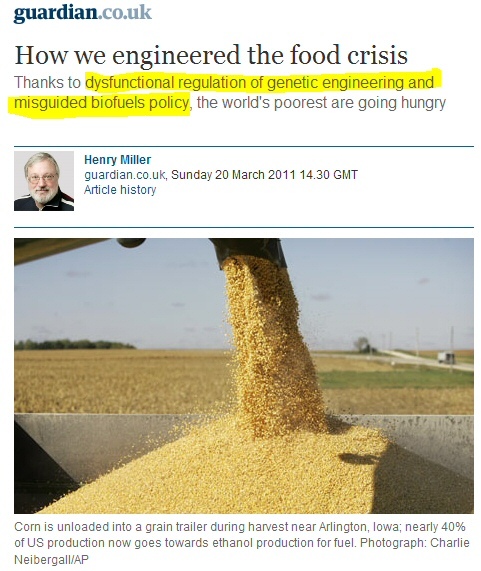 Guardian on the food crisis: nothing to do with global warming | Watts Up With That? Despite paid agenda driven bloviations of “Climate-driven food insecurity“, even environmental media king The Guardian sees the real reasons behind it, and it isn’t global warming aka “climate change”. Instead, blame gets squarely placed on weather, a new virulent strain of wheat rust, the U.N.’s policies related to GM regulation, shifting economies, and biofuels. There are several causes of rising prices. First, large-scale disasters have precipitated localised crop failures, some of which have had broad ripple effects – for example, Russia’s ban on grain exports through at least the end of this calendar year resulted from fires and drought. We know now and for certain that was not caused by global warming, it was simply weather. NOAA’s Climate Science Investigation team came squarely to that conclusion, and found global warming blameless. Second, deadly strains of an evolving wheat pathogen (a rust) named Ug99 are increasingly threatening yields in the major wheat-growing areas of southern and eastern Africa, the central Asian Republics, the Caucasus, the Indian subcontinent, South America, Australia and North America. In the FAO 2008 International conference on Wheat Stem Rust UG99 – A threat to food security report (PDF), neither “global warming” or “climate change” are even mentioned in the report. So there appears to be none of the usual irrational “global warming causes everything” linkage, even within the U.N.
Third, rising incomes in emerging markets like China and India have increased the ability of an expanding middle class to shift from a grain-based diet to one that contains more meat. A lot of this comes from environmental policy, pushing manufacturing jobs there. While the US and EU have gotten cleaner, China and India have absorbed wealth and the manufacturing pollution of the west. And fourth, against this backdrop of lessened supply and heightened demand, private investment in R&D on innovative practices and technologies has been discouraged by arbitrary and unscientific national and international regulatory barriers – against, in particular, new varieties of plants produced with modern genetic engineering (aka recombinant DNA technology or genetic modification, or GM). Genetic engineering offers plant breeders the tools to make crops do spectacular new things. In more than two dozen countries, farmers are using genetically engineered crop varieties to produce higher yields, with lower inputs and reduced impact on the environment. Irrational green fears of “frankenfood” cause regulation of what they fear most. That affects the poor the most, which are traditionally the ones who vote for the left and their policies. In fact, the United States and Europe are diverting vast and increasing amounts of land and agricultural production into making ethanol. The United States is approaching the diversion of 40% of the corn harvest for fuel and the EU has a goal of 10% biofuel use by 2020. The implications are worrisome. On 9 February, the US department of agriculture reported that the ethanol industry’s projected orders for 2011 rose 8.4%, to 13.01bn bushels, leaving the United States with about 675m bushels of corn left at the end of the year. That is the lowest surplus level since 1996. Stop burning food, stop blaming “global warming” for just about everything, and face real problems head on, and the world’s poor might get fed. I used to try to be generous and believe some people are simply misguided in their efforts to help humanity. I am more and more convinced that these are purposeful steps. I believe there are some that are happy to see people starve. Maybe the goal is to NOT feed the world’s poor. Comforting the afflicted comes in a distant second to afflicting the comfortable. That’s what makes them feel One-Up–and that’s what it’s all about: demonizing the Other, scoring points, winning the game. As you and the Guardian point out, there are many reasons why the world is on the edge of a food crisis. One of those reasons is climate related (This is not a controversial statement.) Droughts, floods, and cold weather combine to threaten crop production. You cited Russia. but this is the case in many other areas of the world. Over use of shallow aquifers (Saudi Arabia, and the USA are also major contributors to the problem. As we destroy wetlands we diminish the natural way of storing groundwater, and as glaciers in the Himalayas melt, arable land downstream in India and Pakistan are threatened precipitously. When combined with the declining fisheries around the world, desertification, a global drop in water tables, and a loss of top soil, the global capacity to produce sufficient food for the 90 million new people who will sit at our tables this year (245,000, new people tonight) is jeopardized. Stop it! You’re scaring yourself. None of that has any lasting effect on food production. Bad government policies are to blame, not global warming. Two little hobbyhorses of mine. Let us not forget cellulose ethanol. Hopefully we will get some real production in 2012. Let us also not forget that one of the byproducts of producing corn ethanol is a high protein cattle food. Not all the food in the corn goes to fuel. That global neo-malthusian method has been constantly in my mind, but being naive, I still try to explain the high food prices etc. by mere atrocious stupidity instead of evil conspiracy. I mean, I feel much better that way. 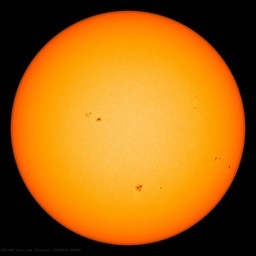 Funny how so many on both sides of the AGW issue need to see things in black and white. Changing climates AND periods of rotten weather AND bad policies AND bad practices can lead to food scarcity issues. To focus on any one of them is to miss the bigger picture. James Sexton is right on when he says “face real problems head on” and Hugh Pepper points out the problems of “desertification, a global drop in water tables”. It’s time to stop wasting billions upon billions of dollars on the foolishness of “Global Warming” or “Climate Change” or “Climate Disruption” or whatever it’s labelled as now. And it’s time to stop fattening the bank accounts of the swindlers like Gore and Pachauri. It’s time to spend the money on de-salination plants to irrigate the land for crops and livestock. We need O2, CO2, H2O and warmth to survive and progress. Hugh seems to have missed all the corrections on glaciers melting, the existence of the green belt in Africa during the pre-Roman, Roman times – now called a desert, trees in Lebanon – man chopped them down for centuries and they grew back. None are so blind as those who will not see – or a climate modeler with a new Petaflop machine on order. It seems the problem of food shortage is not caused by global warming/climate change/climate disruption/climate whatever, but rather by “Global Warming”. The unbelievable notion of growing fuel instead of food is sickening. And the real cause for that is the Green Scare that actually promotes this insanity. A concern about GM food is not that it is modified, but that it is being used by some to gain an exclusive market. The government has enacted new laws and imposed new regulations to support their corporate partners. Together, they gain control over our food, and us. • The GM threats to biodiversity and democracy are closely related. When you pair proprietary technology that’s designed to retain company control of seeds (the very lifeblood of our food supply) along with highly concentrated market control, you get a hazardous blend of ecological, economic, and political centralization. The pollens carried by wind or insect vectors to traditional seed crops introduce unwanted DNA sequences that can be used by GM corporations to sue farmers for seed piracy. The real risk is in reduction of biodiversity, that is, making our food supply more uniformly prone to disease. The fact that this rust UG99 is racing around the world suggests the problem is uniformity of the crop. • Since the beginning of agriculture farmers have encouraged and developed many different traits in cultivated crops by the selective sowing of seed. Eventually hundreds of thousands of distinct varieties of widely cultivated crops evolved. These varieties are known as landraces. • Filipino farmers once grew thousands of kinds of rice. Today only two varieties account for 98% of the area sown. Mexico has lost an estimated 80% of its varieties of maize. Of 8000 traditional rice varieties being grown in China in 1949, only 50 remained in 1970. • Crops saved by resistance found in the landraces: U.S. wheat in 1904 and 1917, Indian rice in 1943, U.S. oats in the 1940’s and 50’s, and U.S. corn and Soviet wheat in the early 70’s. • There has been erosion of the genetic base of crop varieties to such an extent that almost all the top breeders are using the same genetic material. UG99 is being used by GM corporations to break down the barriers to GM wheat, currently not approved, but being tested now. GM wheat might defeat UG99, however, the victory may be only temporary. Further reductions in genetic diversity could make the GM crop even more prone to a future disease. A population geneticist will tell you the strength of a species is in its diversity, not its immediate traits. The winning traits now may not be what is needed in the future when conditions change. Diseases come back with a vengance at times. Malaria was eradicated from much of the world through the use of DDT. As it returns, anti-malaria drugs are becoming less and less effective as the plasmodium parasite develops resistance to the drugs. The time required to acquire resistance is getting shorter. Similar problems are occurring with MRSA staff infections and TB, for example. Pests will find a way to attack any crop. If the crop lacks genetic diversity, there are more opportunities for pests to grow that successfully attack it. These pests then can spread to the entire crop having the same characteristics. GM crops may stop one pest, but leave us even more vulnerable to the next pest. Centralized command and control government is not the answer for climate or for food. Oops, auto fingers: should be ‘staph infections’ (staphylococcus). I have no idea what motivates Greens, but I suspect a mix of Marxism and stupidity must be major factors; when I look at the nonsense kids are being taught about so-called environmental issues, my suspicions strengthen. If all kids, not just a few, were taught how to produce vegetables and flowers (everyone needs beauty in their lives) and some basic practical animal husbandry, we might make some progress to dispelling the silly myth that a slightly warmer world id a frightening prospect. Fear is a useful emotion if it serves to alert you to realities which may cause harm to your life or to the lives of others. When food doesn’t grow, for whatever reason, people suffer as a consequence. It is always best to fully understand the causes of the problem. When aquifers drain it is usually because they are being overdrawn. (too much use, not enough recharge)This is the situation in the mid west USA where the Ogalala aquifer is rapidly depleting. It is always a combination of factors which cause the problem., and yes government actions can have an exacerbating impact. A failure to regulate, for example can create a problem, as can poorly planned development. But it is clear that we are going to have to get very serious about protecting watersheds and the ecosystems in which they are embedded. Changing climate, population growth, resource depletion and other factors, all have to be considered when attempting to fully understand the present and looming food crisis. Let us also not forget that one of the byproducts of producing corn ethanol is a high protein cattle food. C’mon man! That is weak! The cost of corn based livestock feed is going through the roof! In fact, the high cost of feed is one of the main reasons why the herd is not keeping up with demand. Recall ECON101, inpust costs goes up and supply goes down. Any mono-culture is open to invasion. Just ask Windows users. But having said that, it’s time to plant corn for food and not for fuel. You get rat mileage, it wastes energy, and it ruins your car. As for genetic engineering, we are all genetically engineered apes. They were genetically engineered other things. The engineer was random mutation. I do not see the problem. Jim, I hate to break the news to you, but the Cellulosic ethanol plants have been a total failure. One of the subsidized leading Companies that we given awards has shut down and it appears that investors (except Obama) have pulled out. I doubt that they will start up anytime soon. The EPA has scaled back significantly on two occasions the amount of ethanol these cellulosic plants will contribute. Expect more corn and I suspect Obama has made a deal with his socialist friend in Brazil to end or reduce the high tarrifs on imported ethanol. Maybe he will give them another $ 2 billion dollars to match the loan he gave to Petrobras the Brazillian and Soros owned oil company. As with corn or other crops grown for fuel, there is tremendous incentive to maximize the efficiency and profit of the ethanol/biodiesel process thru hybridization and genetic manipulation of the feed stock. Doesn’t make a bit of difference whether the feedstock is switchgrass, trees, or anything else. Cellulosic ethanol plants prefer fast growing, small diameter trees that maximize the desired traits and that are easy to transport and process. Once the available “trash cellulose ” is used up, this will eventually result in huge tracts of land surrounding each plant that are dedicated to a particular GM ethanol feedstock, and devoid of any “biodiversity”. In other words; a monoculture with all of the issues associated with that. There is no such thing as a free lunch. Put that genetically mutated food where the rising sun doesn’t shine. EU Lex (with the fake email addy) demonstrates the irrational fear that greenies have. We are eating genetically modified food now. The corn of today bears little resemblance to the maize of a couple hundred years ago. It has been genetically modified through selective breeding practices over time. Tinkering with genetics is something we’ve done for a long time. The difference today is we can do it faster and on target. GM objections are based on irrational fear. I think that it would be considerably worse if the glaceirs did Not melt, that would dry up all the rivers right away. But since they are going to around till at least 2350 I do not understand whay you would make such a statement, unless you are trying to scare people with your lies. Same for “desertification”, the desserts are in retreat right now; did you not get the memo that global warming now caused more rain and snow? The story that global warming woud cause less rain and snow went out of fashion last year. Hugh: I suggest that you update your cut-and-paste pallet with the current crop of lies, these old ones are not woking anymore. Take 40% off the top of the worlds largest producer, and what do you think happens? Certain? Blameless? Those aren’t the sorts of words skeptics use. BTW, NOAA has said the 2003 heat wave was made more likely to AGW. Yes MikeW blameless, it was a blocking high. Simply weather. NOAA has to throw in the obligatory language so as to not upset the whuffos. Your 2003 point is irrelevant as we are talking about Russia’s wheat export issue in 2010. Before you start to cut-paste in the buts about the flodding in Pakistan last your you should consider the Pakistani flood commissions interim report which they submited yesterday. So it appears that much of the flooding was man made, but not for the reasons that you might have us believe. For some reason I do not expect that we will get an update from the western media as to why the flodding was so extensive and was not contained by the dykes. More on the failures of cellulosic ethanol and the EPA scale back of their to 2% of the original expectations. Time to get honest with the public. So you’re fine with fearmongers. That would put you in the warmist camp then. Yes, and focusing on a fictitious one can prevent solution of the real ones. Based on logic demonstrated above in Mike’s comment, the recent cold spell in Europe must then also be made more likely by anthropogenic influence. To which I suspect Mike will agree with. Stated thus: CO2 influence creates a greater likelyhood of catastrophic heat spells, but then is overrun with natural climate variations to produce catastrophic cold spells. Is that about right Mike? You nailed it, they have got to get rid of at least 95% of people to save the planet. Same as with DDT and Malaria? Whuffos? Aren’t these the people who look before they leap? That is, they are the skeptics. AW is no whuffo. Satellite mapping shows that 80% of glaciers in western China have retreated with the greatest percentage occurring on the north slopes of the Himilayas. It is noted by several authors that the retreat here is faster than elsewhere in the world. The reasonable conclusion acknowledged throughout the literature is that the declining availability of water for use in irrigation downstream will dramatically impair the ability to produce enough food for an expanding population. The best solution to any problem is based on understanding all the causes, and this means taking the most broad perspective, and then every thing comes down to putting your resources where they can do the most long-term good. AGW skeptics seem to want to deny any role in the food supply disruption to climate change, which is silly, because changes in the climate have always affected the human food supply. The only real issue here is, whether or not humans are causing some of that climate change. What there is no doubt about is that policies and practices also affect the food supply and so, adjusting these seems to be a better use of current resources. Sir, you are on a roll this morning! Your comments on this thread are fantastic. I especially want to thank you for your comment on GM food. Mankind has a multi-thousand year history of genetically modifying foods. Consider cattle, swine and domestic fowl. Think they started out that way? Does anyone think domestic corn, wheat or rice crops bear any resemblance to the very same crops grown 200 years ago? How did we get seedless grapes and seedless oranges? Let’s take ethanol out of our gas tanks and put it into whiskey bottles where it belongs. Anthony is a scientific skeptic. You don’t like it because you are unable to make a convincing case for runaway global warming. Linking to Skeptical Pseudo-Science is the best you can do. @Pam: The logic of my post is to look at the research. It is possible the low Arctic sea ice extent influenced the Arctic Oscillation and played a role in the colder weather in some parts of the Northern hemisphere. Researches are still debating the issue and I don’t have an opinion on it. Julienne Stroeve seems to think the, if any, is small. She may well be correct. But see also: http://nsidc.org/arcticseaicenews/2011/010511.html. Smoky, if science was done by name calling you’d be a scientist. It isn’t and you’re not. How would you know what my background is? In fact, you are making an incorrect assumption. You’re just mad because there is no testable, real world evidence of runaway global warming. And there never was. Food-wise, mankind, and all of nature for that matter is far better off in a warmer, C02-enriched world. 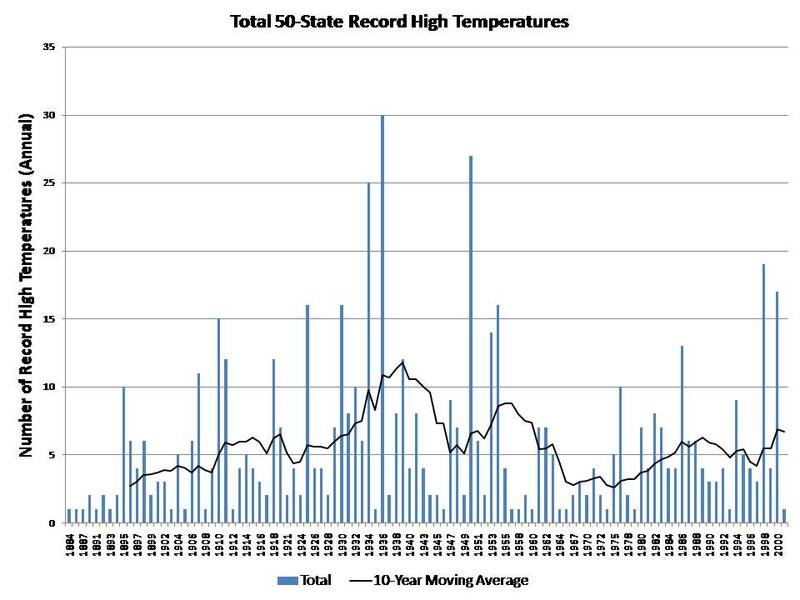 The challenge, which the Warmists can’t or don’t want to see is in fact cooling. That has been true throughout history and will continue to be true. Those who worry about things like some glaciers losing mass, or perhaps a bit of the Arctic ice disappearing are indeed worried about the silliest of all things. It is when those glaciers and the Arctic ice start growing again, which indeed they will, thus locking up that life-giving moisture, and heralding in a colder, harsher climate that mankind should be concerned. I don’t think there is a food shortage on this planet. I think that for the first time in the history of Mankind there is enough to feed all of us. It is all about power (control) You remember the movie ‘Soylent Green ‘ with Charlton Heston? That would mean that they would have data of, at least, twenty four thousand glaciers, since China has more than 30 000 glaciers. However the peeps doing the administration of the worlds collected amount of glaciers says they only have accurate measurement of some five thousand glaciers (that is for which they can confirm is either retreating or advancing) of the more than one hundred and ten thousand glaciers in the databases. So either they, who supposedly know, are utterly wrong by an order of several magnitudes or you’re lying through your teeth or don’t know what’s what. Miller’s views are probably far different from the Guardian’s editors. We should not conclude from this opinion piece that the Guardian finally “gets it”. To second Anthony’s comment on breeding corn. We have been beereding corn for a long time. When we developed hybrid corn there were people who did not want it. And as far as breeding one technique used in the past was exposing the plant to radiation. It worked but you never knew everything you changed. With Gmo products you know exactly the traits you put in the plant. A proud grower of Round up Ready alfalfa. Thanks – given the enormous prize tag attached to fighting AGW, you have just convincingly argued to fix the other, real problems first. Black soot deposited on Tibetan glaciers has contributed significantly to the retreat of the world’s largest non-polar ice masses, according to new research by scientists from NASA and the Chinese Academy of Sciences. Soot absorbs incoming solar radiation and can speed glacial melting when deposited on snow in sufficient quantities. weather and climate change are not mentioned in this article because they aren’t the real causes behind the issues. I agree with most of what you stated, but you are incorrect here. Crop species with male sterility genes produce hybrids whose seeds grow but are sterile, as in corn. Soybeans and wheat at present cannot be bred to produce sterile seeds. The farmers were sued for saving and planting soybean seeds. Anthony, it’s nice to see you in the sandbox with the rest of us! GM crops have been a godsend for the environment….by engineering crops to require less pesticide application, the general environment benefits greatly. Reduction in the use of chemical pesticides associated with genetically engineered crop varieties may be reflected in the recent decline in global agrochemical sales. After five years of growth, 1999 showed a 4.3% reduction in herbicide sales, and a 4.1% reduction in sales of insecticides (Allan Woodburn Associates, 2000). That is my concern; but not only that. I do not wish to eat food that has been genetically modified. It is not a natural process, unlike hybridisation, or even spontaneous mutation. Has anyone proved, to complete certainty, that these ‘foods’ are safe? I think not. There seems to be a huge experiment going on with the human population. How much are they contributing to the excess weight and poor health of so many in our modern, supposedly civilised nations? What is causing all the trouble with bee colonies? We need bees as well as CO2 to keep up our food supply. In addition, once these new, unnatural organisms are out in the general population they can’t be brought back under control. Is this what anyone intelligent really wants? I am definitely not convinced that there has been proper testing to prove their safety before release from the lab. I am appalled at the control over agriculture in the third world that this technology gives to the likes of Monsanto. Far from helping the poor of the world I believe that it will be a terrible stranglehold over their ability to be self-sufficient in locally adapted seed. As far as I can see, the wretched stuff will also only be able to grow with the help of monstrous doses of pesticides, supplied by guess who? Why is GM ‘food’ bred to be highly resistent to pesticides if they are not required? You really think that developing these things by natural selection over many years equates to artificially inserting foreign genes into the DNA? We know now and for certain that was not caused by global warming, it was simply weather. NOAA’s Climate Science Investigation team came squarely to that conclusion, and found global warming “blameless”. A reasonable interpretation from your putting blameless in quotes is that they actually used that word. However, they didn’t…and now you admit that they did not rule out the possibility that global warming played a role. The fact that you interpret this as “the obligatory language so as to not upset the whuffos” does not give license to say that they said something different from what they actually said. REPLY: The blocking high was a synoptic feature, not a climate feature. That my friend, is weather. So it’s still weather, not AGW. And, AGW is in fact blameless in the Russian heat wave. But I get your point about the quotes. I was quoting my own viewpoint, but can see how you could see it based on your worldview. Easy fix, quote marks removed, whining appeased. As for your other claims, while I don’t have data for Russia (presumably NOAA does), I see no evidence of increasing frequency of hot weather events, at least in the USA. Natural gas, natural gas, natural gas. Really, what the hell is wrong with us? Are we led by complete idiots? We are sitting on one of the largest sources of fuel in the world and it produces about %30 less CO2 than gasoline, why don’t we start using it as a transportation fuel and leave growing things for eating. That giant sucking sound is our fuel dollars headed for the middle east. Why not spend them here on fuel produced in America by Americans? Good, since I’ve never argued the case for spending even one dime on fighting AGW. If I remember correctly, Darwin got his term “natural selection” from human selection of traits in animals and plants. Human selection is what Dr. Dave referred to, and in geological terms has only occurred very recently. You appear to be confusing the two kinds of selection. I personally am not sure whether GM crops are on balance a good thing – it’s something I ought to research further. I wonder if it is actually “selection” as opposed to “purposeful design” and I do have some qualms about that as nothing we have ever designed has turned out to be completely predictable. There will doubtless be unforeseen issues, but it’s a question of whether those will be outweighed by the benefits. I hope we proceed with suitable caution. Absolutely. Well, almost absolutely. It’s not “where they can do the most long-term good“, it’s “where they will do the most long-term good“. Time and time again we see ideologically-driven (or plain unrealistically-driven) actions, with the inevitable unexpected consequences. We need to apply the law of predictable consequences to all proposed actions, in order to avoid the law of unexpected consequences. For example : What will actually happen if we encourage vast areas of good arable land to be used to produce fuel instead of food? Or: What will be the actual impact on climate, and on the world’s various economies, if the developed world manages to reduce CO2 emissions by x%? And the actual cost? Natural gas, natural gas, natural gas. Well said. Wind, solar, geothermal, and other alternatives cannot make a dent in our use of foreign oil as we are energy independent in our production of electricity. The most available, and economically competitive fuel for vehicles is natural gas. Here in Atlanta, MARTA converted busses to run on natural gas. The following can be found at the MARTA web site. A: A study conducted by the American Public Transit Association found that in 2001 alone, public transportation use in the Atlanta area saved 19.3 million gallons of gasoline, and kept more than 300 million pounds of pollutants out of the air. MARTA has one of the largest fleet of compressed natural gas buses in the nation, increasing mobility while reducing pollution. The availability of MARTA as a transit alternative saved Atlantans approximately 25 million man-hours in traffic delays. Do not get a flu shot. For that matter, don’t take any prescription medicine, whatsoever. They are created by processes decidely not natural. To be safe, you need to completely stay away from doctors. Forget about chlorinated water for drinking. I have never seen naturally chlorinated water, and surely you must treat fluoridation as a poison. Do not cook your food. Not only is raw the ‘natural’ way to go, heating food changes some of the chemical composition of the food, breaking chemical bonds and creating new combinations. Don’t use soap, shampoo, deodorant, or any type of lotions on your body. Your skin can and will absorb all sorts of “unnatural” chemicals. Don’t use toothpaste. Have you read the list of ingredients? I doubt if they came about in a natural fashion. Don’t eat foods grown with fertilizers or pesticides, or the meat of any animal given antibiotics or hormones, most of all of which are synthetic, not natural. Man has spent the last 10,000 years, or so, divorcing himself from nature. As a reward, our life expectancies are increasing, and our health getting better. Nature is not good. Nature is not bad. Nature doesn’t give a whit about you, and will kill you without remorse. But at least you will die a ‘natural’ death. I prefer to live a lot longer and healthier with my ‘unnatural’ lifestyle. And when I die, it will not be from hunger resulting from shallowly thinking that GMCs must be harmful since they are not the result of an ‘unnatural’ process. All markets manipulated by specultors crash. Those of you interested in growing crops under drought conditions, whether caused by aquifer draw-down or the vagaries of nature, should investigate http://www.originalsonicbloom.com. It shows a plant-growth breakthrough used to give farmers the biggest crop of their lives even in drought conditions. Plus the site is a lot of fun and you can order a sample kit to play with in your own yard. I have a meter-tall indoor Avocado tree I started with my own kit. All my other seeds died. Sonic bloom doubles a crop over time in one to four generations with an increase in nutrient content. Developed to solve world hunger, it still needs carbon dioxide to work. We are carbon-based life forms. How succinctly put! And how true without being cynical: the type of crops, the amount and what they are used for are not determined by social agendas or government fiats, but by the individual in conformity to his personal interests relative to, principally, his economic environment. The part that has a government or social agenda of sorts is tax or subsidy based: even then the individual determines whether or not he plays there. The rich and the middle-class, not just the poor, enter into the food equation at the sharp end known as the cash register. There is no focus going in or coming out on the consumer here in the First Western or the 3rd Eastern, and nor should there be in a democratic capitalist economy. Our governments could, of course, express a social agenda to helping the poor feed themselves if they wanted. They could purchase food grains, equipment and talent at market prices and introduce them into those areas unable to help themselves in ways that avoid killing the local economies. And they could get rid of tax or subsidy based incentives that encourage food-for-fuel that is both unnecessary and market distorting to the detriment of cheaper food. But, as Al Gore admitted, they would have to do so in reverse of buying political support in the food-growing areas (of the EU, Canada and the US). Which is not what doing things for individual self-interest is not about. There is no serious policy about alleviating poverty, hunger or civil disruption in the world by any country. All policies are about containment of threats to the homeland. If improvement in the 3rd world were a real goal even Bill Gates would be visible in its efforts. It is not a physical inability, it is an unwillingness. as glaciers in the Himalayas melt, arable land downstream in India and Pakistan are threatened precipitously. 1. As the glaciers melt, more water is fed downstream. Once they melt completely, the only water still going downstream is EXACTLY THE SAME AS BEFORE THE MELT. The water from glaciers does not come from the glacier fairy, it comes from precipitation. If the the glaciers are melting because of Global Warming, the precipitation will not get less magically, so the same amount of water flows. 2. The Himalayan glaciers are not melting. Patchy knew it and still tried to claim they were. Point (1) still stands, however. Are we talking about rising food prices without mentioning inflationary government monetary practices? Don’t mind the elephant in the room – just give him all your peanuts and he won’t bother you. I don’t think you’re giving the GM skeptics their due. Could it be you haven’t yet given this subject the attention it deserves? Fear of modification wasn’t my problem. Government/corporate control is. As far as I can see, the wretched stuff will also only be able to grow with the help of monstrous doses of pesticides, supplied by guess who? Why is GM ‘food’ bred to be highly resistent to pesticides if they are not required? Annei, I’m sorry, you have it backwards. By inserting carefully selected gene fragments into selected crops, scientists are able to create crops that require LESS pesticides! The pesticides are toxic to the pests (insect larvae for example) and not to the crop itself. In other words, the GMO crop makes its own, very natural pesticidal products that work very nicely. This reduces the environmental release of untold thousands of pounds of very toxic chemicals – organophosphate insecticides are essentially nerve gas compounds originally developed for bioweapons in WWII. Admittedly, the origins of GMO crops had some interesting stories including animal genes inserted into crops (these stories were greatly exaggerated and did not result in any releases). Modern GMO crops are based on sound science, rigorously inspected and tested, and bringing a new green revolution to a hungry planet. There is no relationship to obesity, this is caused by people eating too much damn food. If people want to eat broccoli grown in their own poop, well, I’m fine with that also. It’s just not a very efficient way to feed the world’s population. Hoser’s point is excellent. The possibly saving grace (which, however, pharmas and others generally sidestep when possible with newly patented “tweaks”) is that patents are only about 17 yrs. Their purpose is to force disclosure of their “secrets” without denying some discovery benefits. For the cog dissonance file: The goal of cutting world poverty in half in 10 yrs. starting in 2005 was met in half the time, 5 yrs., by 2010, per the World Bank (IIRC). Mostly due to vigorous exploitation of fossil fuels in China and India. In many regions of the developed countries of the world, it appears that misguided policies such as diverting food towards fuel is being called out as one of the biggest blunders of the green movement. And often it is done the very high priests of the agw theocracy. It is precisely because 40% of all corn grown in the us is burnt in cars that the food supply is in the shape it is now. The problem is not restricted to corn. The real problem is the subsidies given to corn grown to make alcohol. This diverts other farmland that used to grow food towards the more lucrative alcohol-corn. Even a child understands this. So when poorer countries are unable to feed their poor, let’s not forget one of the biggest facilitators for this human tragedy is the green movement who asked governments to do this biofuels thing. I think many elections at the municipal, state levels are starting to show a clear pendulum swinging away from the more extreme expensive interventionist governments. When you hit the taxpayers in their pocketbooks, when you make them pay 15% mor in electricity bills to subsidize furniture stores to put solar cells on their roofs, you will be routed in elections. Those who choose to ignore this will have lots of time to work on their memoirs. Some folks just hate ethanol and no amount of facts will sway them. You are absolutely correct that the costs of all commodities (including corn) have been pushed up by QE. And, they will likely continue to rise. The good news is farmers will be planting as much as they can with these high prices. BTW, the article states there is still a surplus of corn. That means it wasn’t purchased. Can you imagine what the surplus would have been without ethanol? Mankind has a multi-thousand year history of genetically modifying foods. True, but when you have farmers in different regions developing their own strains, you maintain far more diversity in the crops. When rust, for example, wipes out a crop in one valley, the crop in the next valley over may be resistant. Not so today. We are putting our civilization at risk by reducing the genetic diversity of our crops. The random mutations screened and propagated using traditional agricultural methods are more beneficial in the long run because Nature can test them all. Nature selects the ones that survive diseases and other factors, while humans select the variants with properties we like. There needs to be a balance between natural traits and those humans like. Grapes with tough skins and seeds are better in the wild, while we enjoy the opposite, propagate those, and in return we protect the grapes we cultivate. That is mutualism. Our process for making crops more appealing does weaken them. Natural traits are there for good reasons. The biggest danger to us comes in growing progressively fewer types of crops with less genetic diversity. Do we really want all farmers to have to purchase new seeds every year? Is it wise to make seeds produced by a farmer’s crops non-viable? What do we do if somehow the corporate seed supply is cut off? Do we want to allow GM corporations to sue farmers who plant crops using their own seeds when their own crops are modified by pollens from GM crops grown by others miles away? Do we want farmers to abandon their tradition seed stock if they become contaminated with ‘terminator’ seed traits? Can nations barely feeding themselves now afford to lose any percentage of their crops due to non-viable seeds produced through pollen contamination from nearby GM crops? It is time for farmers to sue the GM corporations for failing to contain their damned GM pollen. A collapse of GM food production could produce starvation on a scale we have never seen. GM food itself is not the problem. It is the combination of “progressive” government control over populations using enthralled corporations that no longer need to compete due in a protected economic environment created by government laws and regulations. Food is just another example of the total control government seeks. A parallel is AGW hysteria. Regulating CO2 allows government to control everything that breathes. I’ve known and interacted with some very bigoted people. I still do, we all do whether we know it or not. But their bigotry is born of simple ignorance, misconceptions and stereotyping. Sadly, this will be with us for some time. But what we’re seeing here, is something born of a different mother. I can’t quite see where its coming from. Its subtle. Its slippery. And much more sinister. I’ve considered this often. And I still can’t quite articulate what it is that’s happening. Jer0me or someone knowledgeable. Thanks for your comment about glaciers. We keep hearing about “when the glaciers are gone there will be no more water in the streams.” Whatever… BUT if it was getting colder, and the glaciers were, growing would stream flows decline or stay about the same assuming precip remained constant? Ignoring possible reduced precip in a colder world, would river flows decline? It would seem so. Cold and dry sure is not good for growing things. I suppose there is not “one” answer for all situations. It’s not the science of GM that’s frightening, it’s the motives of the companies who develop it. Hoser nailed those fears IMO. Is it irrational to fear handing complete control of the food supply to corporate profit motives? Can we have a thread discussing this science based on evidence, with references to papers (peer reviewed or not)? I’d especially like to see a cost/benefit comparison between selective breeding and GM for the whole cycle from lab/seed to my dinner plate. I’d like to know ALL the pros and cons from an unbiased POV, because without evidence the whole argument is “irrational” IMO. I agree there is a lot of fear, it has been used by various agendas on both sides, can WUWT cut through the hype on both sides and present the facts so we can make our own minds up please? You missed the point of what I was saying. I do NOT think that inserting artificially acquired genes compares in any way with ‘Natural selection’. I think it is most unnatural….and did you read my post immediately above the one you quote? I certainly do NOT want to eat GM ‘foods’…I do not trust their effect on health and the environment. Additionally, I am not in the least bit confused by the difference between genuine natural selection and the artificial insertion of foreign gene material into the DNA of plants. Now, I think that is ridiculous. As it happens, I use very little of the over-scented oils, potions, etc., but I am surely entitled to use what I see as being useful in my own life without being accused of being a hypocrite. Actually most of those he cited have lasting effects on food production. Soil depletion, reliance on artificial fertilizers, and overuse of aquifers are quite real and quite serious. The only thing Pepper got wrong was global warming. That’s a boon to agriculture. Plants grow bigger and faster using less water as atmospheric CO2 rises and the warming part of global warming isn’t global in either time or space. Greenhouse warming from CO2 is concentrated in the higher latitudes, in the winter, and at night which is exactly what the doctor ordered as this extends growing seasons where longer growing seasons are most needed. Fossil fuels are a long term concern because they won’t last forever and get increasingly expensive to recover as more and more of the low hanging fruit is harvested. We don’t need to stop using fossil fuels, per se, for quite some time. What we need is a less expensive alternative to them because the cost of energy is reflected in just about everything we use and consume from basic survival needs right up through luxury goods. Economic growth tracks energy consumption. Less expensive energy is like the tide that lifts all boats equally, or alternatively, lowers them. So far all the alternative energy sources are more expensive. As the price of fossil fuels rises these alternatives will become less costly in comparison but that’s just like choosing the lesser of two evils. What need is a choice between good and better. I have every confidence that synthetic biology is the answer to less expensive energy and it’ll be here real soon now. There are already pilot plants being built able to produce diesel oil and ethanol at a projected cost equivalent to $30/bbl light sweet crude oil using nothing but municipal waste water (high in nutrients and saves in treatment costs), non-arable land, sunlight, water, CO2, and genetically engineered cyanobacteria (blue-green algae) that have been modified to produce hydrocarbon fuels as metabolic byproducts in high weight per dry volume ratio. Naturally occuring organisms are marginal at best for production of biofuels as the biofuels are metabolic byproducts that don’t aid in survival in the wild so production is minimal in naturally ocurring organisms. Organisms grown in artificial environments don’t have to compete with wild organisms as the environment and their ability to tolerate it can be manipulated such that it is not conducive to wild types. One pilot plant being constructed near me using a patented GM algae is supposed to produce 20,000 gallons of diesel per acre with essentially nothing more complicated to extract the fuel than squeezing them like grapes, filtering out residual solids, and separating the fuel from the water. The remainder after the fuel extraction is a nutritious livestock feed. You can’t beat that and it’s only going to get better, faster, and cheaper as time goes on. Most of the developed countries are producing materials,which effects global warming. I agree with your post above. It’s the global warming scare that is being hyped and reinforced by self-serving grant applicants and politicians that I object to. As you make clear, the free market always provides solutions if left alone. Bad governments can’t resist the urge to meddle, and that is what reults in starvation. For the first time, I disagree with what is on this website because a portion of this article discusses the “irrational fear” of GM food. There are many studies, most of them buried because of the powerful corporations involved about the allergic reactions to GM food. The studies that have been done on rats and mice who have been fed GM soy that we are currently eating are disturbing. We in the US have been living in an experiment without our consent and we are getting sicker and sicker than the rest of the world. And you wonder why when Wikileaks had several parts documented the threats the US government gave to European countries about GM when they wouldn’t accept the US’s science experiment. They actually looked at the studies and saw how untested and possibly dangerous they could be and said no way. Also, the whole idea that GM varieties can increase crop yields etc., take a look again. Many of the yields with GM varieties were smaller and oh yah, farmers were saddled with pesticide costs that were much more than they had before. But of course all of these are “irrational” right? No thanks, I will stay away from Corn, Soy, Cotton and Canola unless I can guarantee it is organic. Not warming – cooling (and drying, which at the global level, goes with cooling). The issue is not the total amount of water integrated over a year, but the distribution of the water flow over the year. What is important in many of those downstream areas is to have the water available during the relatively hot and dry summer months. I have no such confidence. All biological systems are highly inefficient in their use of energy. The energy available for useful work is always much, much less than that input into the system.